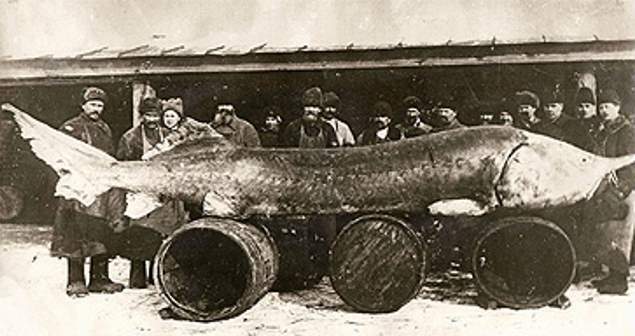 A beluga or European sturgeon (Huso huso) captured in 1922 in the Volga Estuary. It is not a record breaker, but probably at 7 meters (23 feet), one of the largest European sturgeons ever caught. The beluga or European sturgeon (Huso huso) is a large predator which feeds mostly on fish, also rarely consuming waterfowl and seal pups. It is a species of anadromous fish (the fish migrate from the sea up into fresh water to spawn; examples are salmon and striped bass – Greek: ἀνά ana, “up” and δρόμος dromos, “course”) in the sturgeon family (Acipenseridae) of order Acipenseriformes. It is found primarily in the Caspian and Black Sea basins, and occasionally in the Adriatic Sea. The largest accepted record is of a female taken in 1827 in the Volga estuary at 1,571 kg (3,463 lb) and 7.2 m (23 feet 8 in). Several other records of aged sturgeon exceed 5 m (16 ft). These great sizes mark the beluga as the largest freshwater fish in the world.